Yes, I am, in fact, a victim of Frozen fever. Not the short, because I haven’t seen it (yet), but the movie. I really loved the artwork, the songs, the story - everything. Yes, there are flaws, but overall, I enjoyed the movie immensely. With that said, I purchased this particular book because I cared enough about the material to say to myself that I can invest in an “Art Of” book without wasting $40-50. Yes, art books are expensive. I was not disappointed. The artwork is absolutely gorgeous - both hand drawn and digital. I still have more admiration and respect for hand drawn animation since it’s not as popular and I think the magic of creating a moving image by a hand and a pencil/pen is just incredible. Even so, the digital artwork for this film was equally incredible. I have a ton of more respect for animators. I loved the extra designs and the scrapped designs of the characters. Learning the history of the film was really great! It’s really clear that the animators and writers knew what they were doing when they made the film - they did their research! 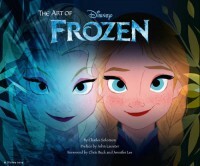 I think the only people who would enjoy this book are fans of Frozen and animation gurus. There was a lot of jargon in the book that I didn’t understand when it came to certain terms about the animation and designing. I’d probably understand what they were talking about more if I took an animation or design class. Overall, it was a very enjoyable book, the craftsmanship is incredible, and I learned a lot about this lovely film! I give The Art of Frozen an A+.